This is the killer graph from this recent Michael Clemens talk on labour mobility. 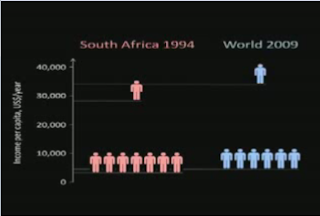 The ratio of rich country citizens to poor country citizens in the world today is roughly similar to the ratio of whites to blacks in 1994 South Africa. Lifting apartheid in South Africa has kickstarted the process of convergence. Incomes for blacks are now catching up incomes for whites. Image what lifting global apartheid could do. True globalisation means extending opportunity to people born without it but who deserve it just as much as me.